Your kitchen is the epicenter of your home. No other room sees more use by your family or attracts more guests when you entertain. No other room requires such a critical layout to be comfortable and efficient, where factors like great lighting, the right surfaces, modern and efficient storage, and seating areas all combine to make a great space. And no other room can help to increase the value of your home like a properly designed and newly remodeled or updated kitchen. We apply the art of great kitchen design, artistic creativity, and extensive product knowledge to every project we touch. Our experienced staff is extensively trained in all aspects of kitchen remodeling. Select from four beautiful lines of fine American-made cabinetry from Wood-Mode and Brookhaven as well as Woodland Cabinetry from South Dakota in our Mokena showroom. 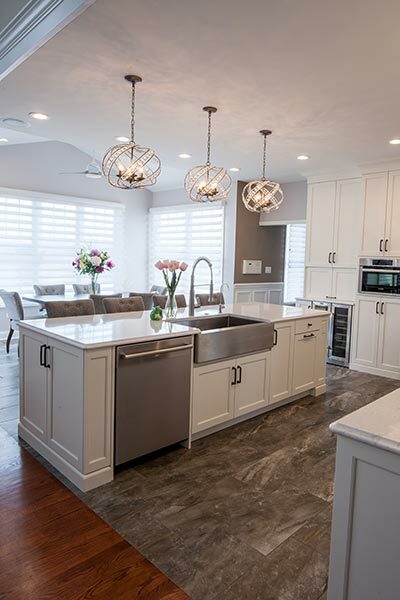 Cambria quartz is a client favorite on our projects, as well as multiple other quartz manufacturers and granite as well. We also design and install custom LED lighting that is both gorgeous and highly functional. Please spend a minute in our photo gallery to see some of the recent projects we’ve completed and gather some ideas. Your kitchen can look this great too! How do you get started on a project like this? Begin to look critically at your existing kitchen. Make a list of the features you love and those that you wish were different. Begin to fill a file with photos, website links, and other ideas that have caught your eye. Is a larger kitchen needed? Maybe more counter top area or more efficient storage space? For now, don’t think about cost. In this stage, we’re looking for your input, your wishes and desires and anything else that will go into your perfect kitchen! Ready to begin the process? Now is the time to contact Philbin Construction and Remodeling to take the next step towards your dream kitchen. We will meet with you in your home to help determine the best possible designs, make the most of every square inch of space and do our best to fit it all into a budget you can work with! We design and build kitchens for families, for entertaining, and for you.